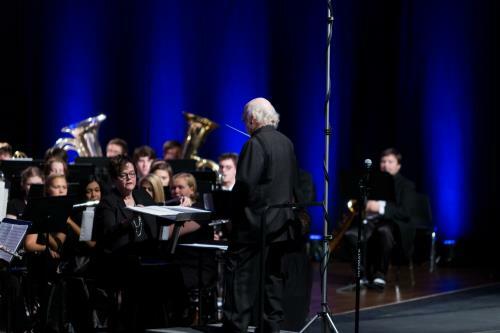 Seventy-eight high school students representing 30 high schools from seven states will arrive at Lee University for Honor Band 2018 and will present a concert on Saturday, Nov. 17, at 1 p.m. in the Conn Center. Dr. David Holsinger, director of the Lee University Wind Ensemble and acclaimed composer, will serve as the clinician for this year’s Honor Band. The Honor Band will perform pieces by Vasilj Agapkin, Howard Hanson, Dmitri Shostakovich, John Philip Sousa, Vaclav Nelhybel, and David Holsinger. The students were selected for the Honor Band based upon information submitted by the students, in addition to recommendations from their individual band directors. Lee students will also perform during the weekend in the Honor Band Collage Concert on Friday, Nov. 16, at 7:30 p.m. in the Conn Center. The performance will feature Lee’s Symphonic Band, directed by Dr. Mark Bailey; the Jazz Ensemble, directed by Alan Wyatt; and the Wind Ensemble, directed by David Holsinger. Both concerts are free, non-ticketed, and open to the public. For more information about the Honor Band or the concerts, call 614-8263.